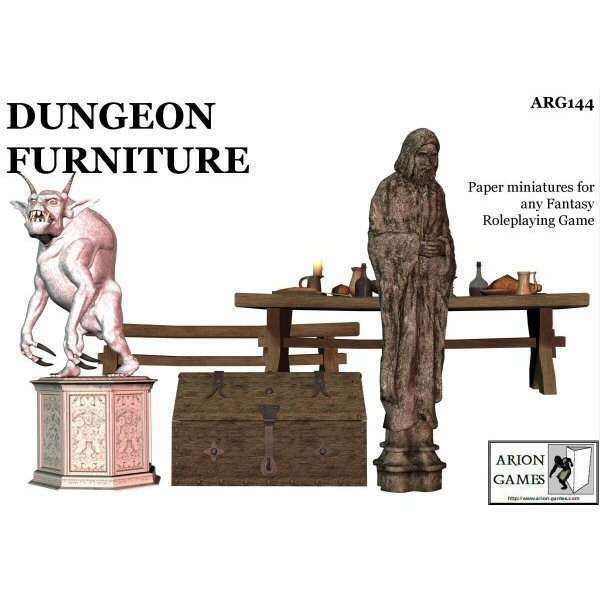 Sometimes you need dungeon furniture for your battlemaps or 3D dungeons in a hurry. You don't have time to make intricate models, but still want something that stands out. And this latest release from Arion Games is just what the GM ordered. 30 different pieces of dungeon furniture, presented as super-easy to construct 3D models, this set will give your dungeon map that standout look in no time. Released as part of our 7th Birthday sale, this set is currently at 30% off and will count towards the $10 needed for the bonus sets. This looks very good. Congrats! I only want to know if you plan to update the sets that are avaiable from E23 of SJGames. I bought some of them and was not pleased that many lack tha power point version =(. I also would love to see your products there, as is the only place that i buy my things. Mateus090985 wrote: This looks very good. Congrats! I only want to know if you plan to update the sets that are avaiable from E23 of SJGames. I bought some of them and was not pleased that many lack tha power point version =(. I also would love to see your products there, as is the only place that i buy my things. I'm sorry about that, originally i didn't supply ppt versions, and i thought i had updated all of the stores. E23 is slightly different from the others in that i cannot log on to see which files are there etc. But if you forward (to admin@arion-games.com) your sales confirmation from E23, i will send you the ppt versions for the sets you have bought. I will also ask E23 to confirm which updates i need to do, and the dungeon furniture should be available in a day or so. Right, than you. If I send the order number is enought, with a screenshoot of the order details?